at any rate, i felt like this image needed its own post. about a year ago, i drew a sketch card of stitch for my friend since she loves her some stitch (plus, she asked for it). =P well, this year for her berfday, i drew pretty much the same sketch card but it's the Tron Stitch version cuz she's all over the new Tron movie now. 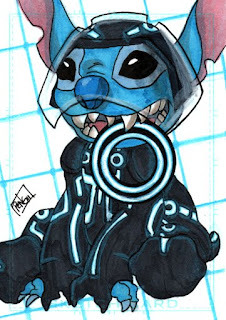 the design of Tron Stitch was not at all my creation. i found it online. i'm assuming japan's got some kind of Tron Stitch animated thingy. who knows, they always have cooler cartoon stuff. so anyways, i colored this with copics. i know it's tough to tell with the scan, but i tried to get the glows of the lines in his outfit with blue colored pencils. yeah we saw it on dvd. she IS hot. =P the movie was certainly pretty but i got REALLY bored after a while. that wasn't a good sign. but no pics of liam in his spidey shirt?? =( guess we'll need to grab him a new superman one too eh. ;P kinda small now?